This is an update on one of our favorite dishes and it’s also our contribution to this week’s Food Quote Meme. With it just being me and the husband for the last few weeks, it has been easier to cook simple dishes for dinner. Sometimes we have breakfast for dinner! That was just the case the evening that I made this version of Shrimp and Grits. Actually, the photo is from the second time that I made this dish in the last couple of weeks. Yes, it’s that easy and it’s that good! This is the first part of the Shrimp & Grits recipe. Start cooking your grits first as it will take longer to cook than the shrimps. Is a small pot, bring one and a half cups of water to boil. When the water is boiling, SLOWLY add the grits while stirring at the same time so you don't get clumps. Add salt and cook on medium heat for a couple of minutes while stirring constantly. Lower heat to low and cover pot. Let it cook for 10-15 minutes, stirring once or twice just to make sure it doesn't stick to the pan or clump up. Go prepare your shrimps while your grits cook. 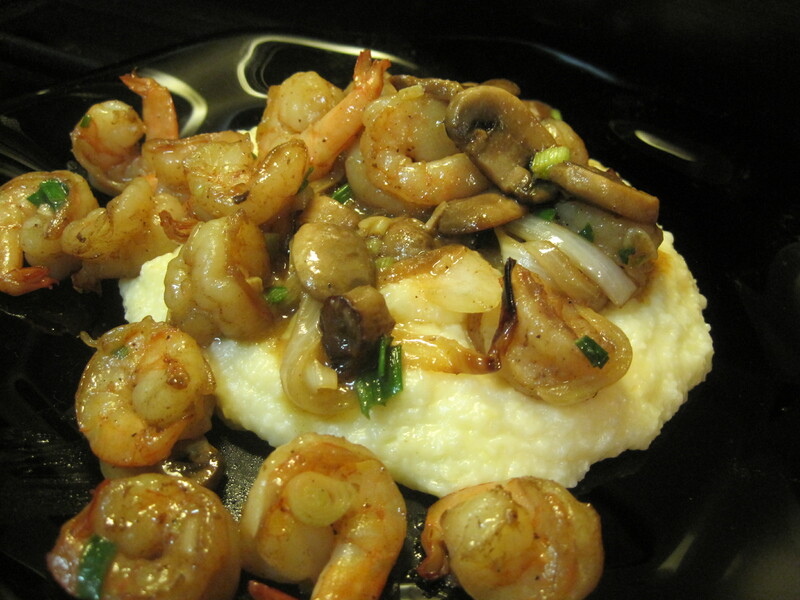 By the time you finish cooking your shrimps, your grits should be nicely thickened and well cooked by now. Just before plating, add the grated cheese and stir until it is all melted into the grits and the mixture is smooth and creamy. You can serve this shrimp dish over rice or pasta but our favorite way is with cheese grits! Melt the butter until foamy and add the mushrooms and onions. Stirfry for a minute or two until the shrimps turn opaque. Add the green onions (scallions) and season with salt & pepper. Stir for another minute and it’s ready to serve! 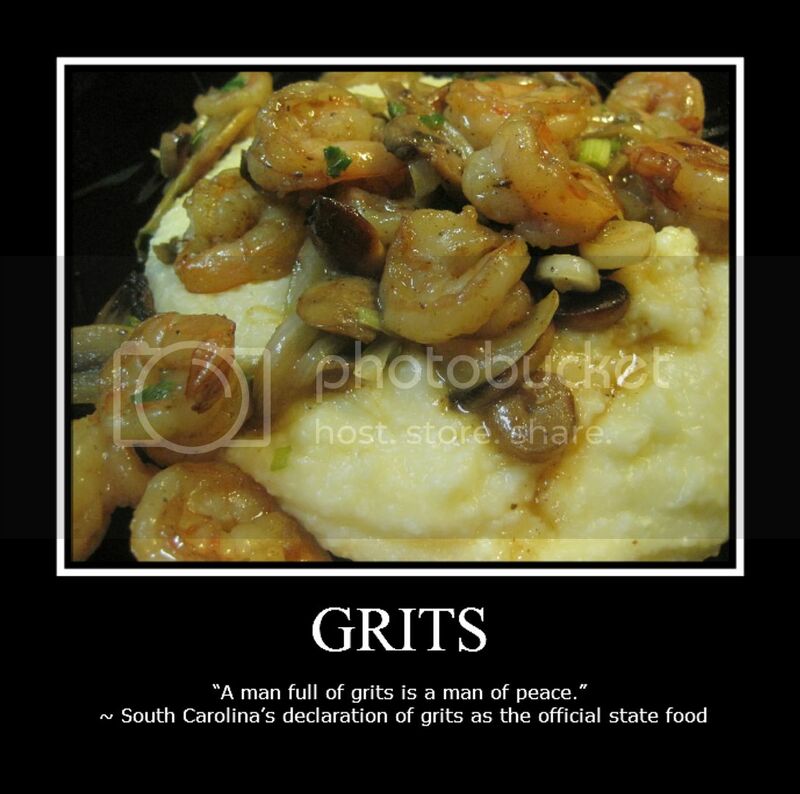 For those unfamiliar with grits, here’s a link to another recipe for Shrimp and Grits with additional information on the history of grits. you cook good, ate Jean! ^^ i wish i could taste this. thank you for faithfully playing food quotes. you help it stand alive and still going in spite of your hectic sked at times.